It is told that a Chickasaw Indian chief by the name of Iuka, sick and beyond the ministrations of his tribe’s healers, heard of the curative powers of the natural spring waters found at a location in what is now northeast Mississippi, not far from the Tennessee River. Eager for a cure, he had his people carry him there. Drinking deeply, he was relieved of his suffering. He recognized the powers inherent in these waters and chose to make his home there, where he stayed until the end of his days. Chief Iuka hasn’t been the only benefactor of the springs over the years. Slowly filtering through countless miles of underground rock strata and accumulating the minerals that gave them the rare properties that so many sought, the waters found their way to the surface, and into the history and mythology of Tishomingo County. White settlers coming into the area followed Chief Iuka’s lead and the town of Iuka, named after this chief, grew around the six springs. Prosperity followed and in 1856 the Memphis and Charleston Railroad came through, the choice being influenced by the springs, although a more logical path lay several miles away. But the presence of the railroad made Iuka a strategic target for Union troops during the Civil War. Three major engagements were fought in and around the town. (above) and several of the pavilions (right) that were built over the springs. Following the Civil War, Reconstruction wasn’t the only hardship facing the south. Yellow Fever spread through the populace, but Iuka was spared and became a place of refuge with people coming from as far away as Memphis to escape the scourge and to seek the restorative waters. 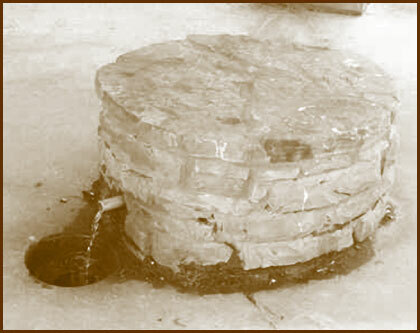 Iuka’s exemption from the disease was credited to the springs and the fame of the waters spread. Less than two decades following the end of the Civil War, Iuka was a fashionable spa, a mecca for the wealthy from the North and the East—places like Washington, D.C. and New York City. 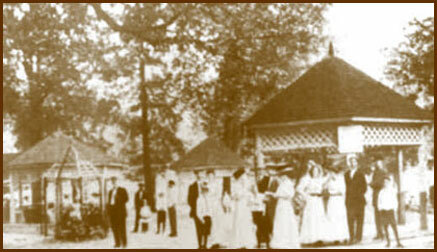 The Mineral Springs Hotel was built in 1872 and pavilions were erected over the springs for those “taking the waters.” Visitors strolled among the oaks and elms of Mineral Springs Park, and gathered around the park’s bandstand to listen to concerts under the stars. World famous orchestras played to gala dances in the Mineral Springs Hotel’s gaslit ballroom. Bookings were solid from May until September. The waters blessed more than just the body and soul. 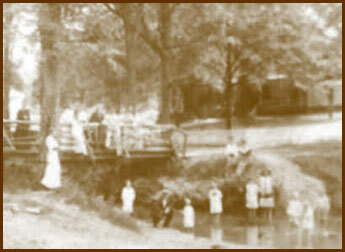 of prosperity that the mineral springs brought to Iuka. 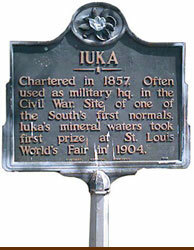 Then the attention of the world was focused on the waters of Iuka when, at the 1904 St. Louis World’s Fair, a panel of judges deemed Iuka’s mineral water “best in the United States” for purity and mineral content. Bottled Iuka water became a much sought after commodity. But World War One ended any hope for cashing in on this fame. Iuka’s dreamed-of prosperity became another casualty of the war. The waters’ devotees and the special trains from the East dried up as did the springs’ flow from the build up of mineral deposits and from neglect. During the Depression years, the bandstand and pavilion fell into disrepair. 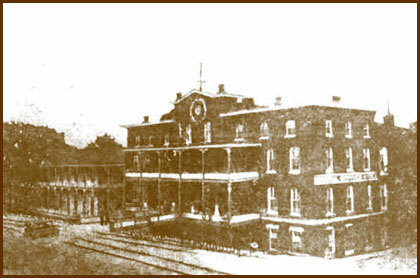 Finally, the grand Mineral Springs Hotel was lost to fire. In the 1960s, a group of Iuka businessmen started a campaign to restore the springs and the park to their original condition and give the community a boost. Sadly, this endeavor died in the making. However, in the 1970s, Iukan George Page led a civic-wide project to improve the park for the enjoyment of the town’s children, “our most valuable asset.” With money raised by the local Lions Club, and matching state and federal funds, new playground equipment and benches were installed. A new bandstand was built, and an authentic log cabin was located and moved to the park. Cindy says that the park has a certain mystique about it, this “walk through history.” Not too far away, Chief Iuka’s grave is supposedly part of the foundation of the BankcorpSouth building. He chose this place to live out his life and now it seems that he has become a solid part of the locale, imbedded in the physical as well as the historical, forever associated with the healing waters of Iuka’s Mineral Springs. For those of you with a chemist’s curiosity, here is the analysis of the waters of the Magic Springs of Iuka. For chronic malarial chills, loss of appetite, anemia, and general debility. Analysis: largely Peroxide of Iron, small quantities of Aluminum, Chloride of Lime, Chloride of Potassium, Chloride of Sodium, Free Carbonic Acid, and Sulphates in small proportions. For dyspepsia (indigestion) and stomach troubles of all kinds. Analysis: largely Sulphurated Hydrogen, Free Carbonic Acid, with a small amount of Bicarbonate of Magnesia, Bicarbonate of Lime, Bicarbonate of Potash and Soda, and Chlorides of Potassium and Sodium. For nervousness and as a general tonic. Analysis: Bicarbonate of Iron, Free Carbonic Acid, with small amount of Bicarbonate of Magnesium, Bicarbonate of Potash, Bicarbonate of Soda, and traces of Chloride. For sore eyes, ulcers, inflammations and sores of rheumatish. Analysis: Protosulphate of Iron, Sulphate of Soda, Carbonate of Magnesia, Chloride of Calcium, Sulphate of Aluminum, Earthy Phosphates, and Iodine combined with Magnesium. For Bright’s disease and all affections of the kidneys, bladder, and stomach. Analysis: Protoxide of Iron, Chloride of Sodium, Chloride of Calcium, Sulphate of Lime, Sulphate of Magnesia, Sulphate of Soda, Sulphurated Hydrogen Gas, and Carbonic Gas. Analysis: Iron, Calcium, Magnesium, Bicarbonates Silica, Sulphate of Radicle, Sodium of Potassium, and Chloride.